I’m surprised at the number of people I meet who claim to follow Christ while disregarding or neglecting the things He tells us about living. If we claim to be Christ followers, doesn’t that imply that we choose to follow what He says? I know I’ve failed to follow Christ as I should and there are times I neglect what He says (that’s sin), but the overall bent of my life includes my desire and choice to follow and obey Him. Do I always love God and people as Christ commands? No, but I’m better at it now that I used to be; I want love for God and people to rule my heart. We find what Jesus said in the eyewitness accounts that make up the New Testament. The New Testament was written primarily by people who were eyewitnesses of Christ’s resurrection or by people who compiled their accounts through God’s inspiration as they interacted with eyewitnesses of Christ’s resurrection. A number of the New Testament authors weren’t sure Jesus was who He claimed to be until they saw Him after His resurrection. The resurrection confirmed for them that Jesus was legit; He was both God and Lord – the Messiah who came to save the world. As a result of this, many of them gave up their lives because of their commitment to the truth of Christ’s resurrection; that He was indeed God. Paul was someone who hated the name of Jesus and violently persecuted Christians until he became one. Paul became a Christian because he had a personal encounter with Jesus after Jesus was raised from the dead. He became one of the most powerful Christians of the first century and God used him to plant many churches and write much of the New Testament. He too, lost his life for his faith in Jesus Christ. God uses Scripture to prepare and equip us to live life to the max. Think about the idea of taking a certain path each day, and while on that path you have opportunities to make changes in your direction. Scripture teaches us the wise path to choose and because God loves us so much, He’ll also use Scripture to show us where we’ve made an unwise choice and gotten off the best path. God’s love continues because He provides Scripture to show us not only where we got off the best path, but how we can get back on it. And He can use Scripture to teach us how to stay on the best/wise path in the future. 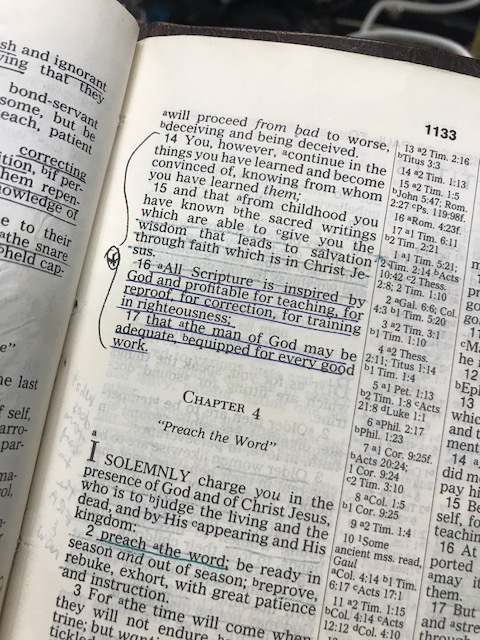 If you’re a follower of Christ, you cannot make wise decisions about life apart from a consistent intake of the things Jesus taught and the things God inspired the authors of Scripture to write for us. All Scripture is inspired by God and is useful to give us wisdom in choosing our direction! Someone once said: “Seven days without the Word makes one weak.” I know it may sound corny, but it’s true. We grow in spiritual strength with a steady of diet of Scripture that’s followed by exercise (applying what Jesus says in our life). Don’t know where to start? Read a small portion of the Gospel of John each day and ask God to help you understand it so you can apply the principles you discover. Follow this by doing the same with 1st John, and then read the rest of the Gospels (Matthew, Mark and Luke). Follow these by reading the rest of the New Testament; take your time and reflect on small portions of Scripture asking God to help you apply their truth in your life. Bible.com is also a great place to find a reading plan if that’s what you need to get started. If you want to know more, stop by the HUB at Grace Fellowship on Sunday if you’re in the area and we’ll help you discover how to take some Next Steps. This entry was posted in Uncategorized and tagged Bible, Christ, Christians, decisions, direction, equip, inspired, path, Paul, prepare, rebuke, resurrection, righteous, Scripture, teaching, wise. Bookmark the permalink.